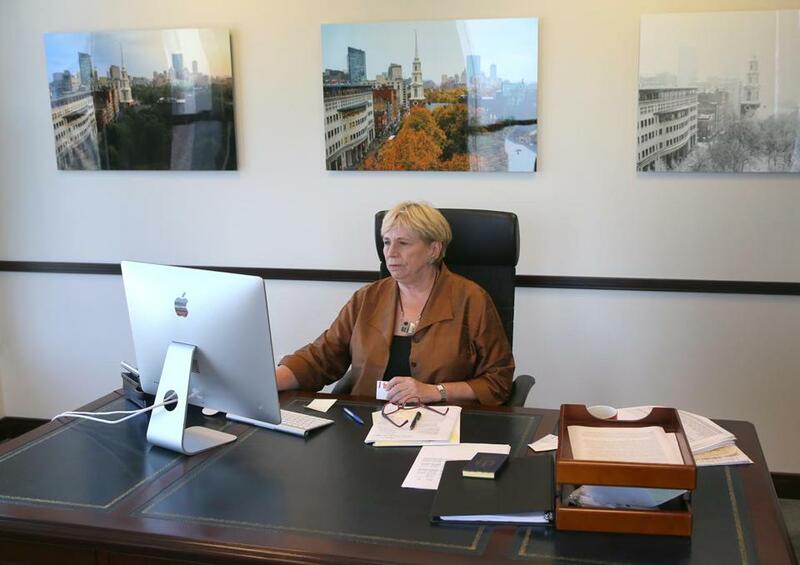 Suffolk University president Margaret McKenna in her office last year. 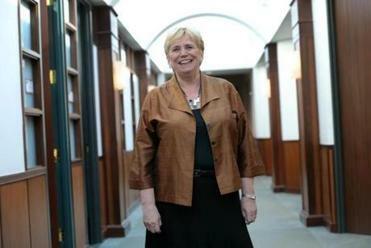 Embattled Suffolk University president Margaret McKenna Sunday fired back at trustees, slamming them as attacking her performance and character in the press rather than to her directly — and as hurting the university in the process. “Both Suffolk and I deserve better,” she wrote at another point in the letter, which was obtained by the Globe. The letter came a day after some board members, including chairman Andrew Meyer, publicly criticized McKenna for what they called a “confrontational” style and unauthorized spending they said could leave the school with a deficit for the first time in at least five years. McKenna’s job is on the line after one trustee privately suggested Thursday that she step down because there were enough board votes to fire her. McKenna has refused, and a number of students, faculty, and alumni have rallied in her support. McKenna’s real mistake seems to be operating under the delusion that she is in charge of Suffolk University. The board plans to vote Friday on whether to oust her — the school’s fifth president in five years — and possibly name former state attorney general Martha Coakley as president. McKenna’s letter to trustees was her first communication since Meyer on Friday sent her a cease-and-desist letter warning her not to speak openly about her situation or use university resources to campaign for her job. In her letter Sunday, she wrote that the board has never directly told her its concerns about her performance. Several trustees contacted Sunday did not comment on the 3½-page missive. Meyer, reached via text message, said he had not had time to read it. Trustees Bob Sheridan and Jule Kahn also said they had not read it. Trustees Mark Sullivan and William T. Hogan III did not return calls for comment. In the letter, McKenna responded to eight criticisms of her leadership that have appeared in the press, ranging from spending on a building lease to a lack of fund-raising to missing portraits. On Saturday, trustees said unauthorized spending by McKenna has put the school on track to run a $2.4 million deficit. Board members said they were alerted to potential financial problems at the school in early January, when the school’s finance officials told them the college was on track to run a deficit. In response, the board’s finance committee held an emergency meeting with Danielle Manning, the senior vice president for finance and her staff in January, Meyer said. McKenna walked out in the middle to attend a live Political Happy Hour event with US Representative Stephen Lynch, Meyer said. Manning did not respond to an e-mail requesting comment. McKenna extended a lease on the Beacon Hill Archer and Donahue buildings by six months, which will cost an extra $2.3 million in rent and moving expenses, and also spent $670,000 on the Happy Hour marketing events with The Boston Globe without the board’s approval, said trustee William T. Hogan, who chairs the board finance committee. Hogan also said McKenna, who earns about $650,000, has raised less than a million dollars so far, even though the school is counting on $3 million in new donations before the fiscal year ends June 30. About the deficit, McKenna said in her letter that she arrived in July facing a $5 million budget gap, largely because of decreased enrollment at the law school, that has now shrunk to $2.3 million with a plan to break even by the end of the fiscal year. McKenna said no contract has been signed with the Globe, but whatever the cost of the marketing agreement, it will be within the university budget. Suffolk and the Globe have “worked together on a number of events, we have placed some ads, and we continue to be in discussions about the extent and cost of an on-going partnership,” she wrote. About the Beacon Hill buildings, McKenna said in the fall it became clear that renovations in other buildings would not be done in time to replace space being lost in the sale of the Archer and Donahue buildings and said she learned renovations could be done more economically. McKenna said she gave reports to the board at the September and November board meetings about the plan to stay in the buildings and discussed with the trustee building committee a plan to extend the lease and rebid parts of the renovations, which she said would result in a $10 million capital savings. The letter also addresses Suffolk’s polling institute, the Beacon Hill Institute, and fund-raising. McKenna said the school raised 20 percent more in the first six months of the year than last year and said she has a strategy to raise $2.8 million by the end of the year. “To make any judgement of a new president’s ability as a fund-raiser after six months and with these results is unwarranted and simply not true,” McKenna wrote. As the standoff between the board and the president continues, a group of Suffolk alumni have organized to express frustration toward trustees and ask them to take more time before deciding whether to fire McKenna. “We are deeply concerned that the university’s reputation may not withstand another leadership transition and that the board of trustees are willing to gamble with the future of the institution,” said Jared Cain, who was student government president of the class of 2008. Alumni have started a crowdfunding page that raised $8,000 to buy an ad in next Sunday’s Boston Globe, to express frustration with trustees. They have raised their goal to $20,000 to pay for more publicity, according to the crowdfunding page. Colin Loiselle, president of the student government association, has said his group will take a vote of no confidence in board chairman Drew Meyer at its meeting Thursday. He also has plans to meet with Meyer Monday morning, which Meyer confirmed. Meyer said earlier Sunday that he is also scheduling meetings with faculty and alumni, who have separately organized a forum to be held on campus Tuesday afternoon in support of McKenna. “We are not potted plants. If we do not exercise our responsibility as trustees and recognize and take steps to correct any problems that are occurring at the university, then that will directly impact tuitions, salaries, the endowment, and potential layoffs, and our job is to not let that happen,” Meyer said in a tele phone interview on Sunday. Loiselle said students plan to ask Meyer for more transparency and to keep McKenna, in addition to calling for his ouster. “We remain steadfast in our vote of no confidence and our call for his resignation,” he said by phone Sunday.